Stuttgart is the capital of Baden Wurttemberg, the third largest state in Germany in respect to both area as well as population. The state is divided into 35 districts and 9 independent cities that have been further grouped into four administrative districts by the government. 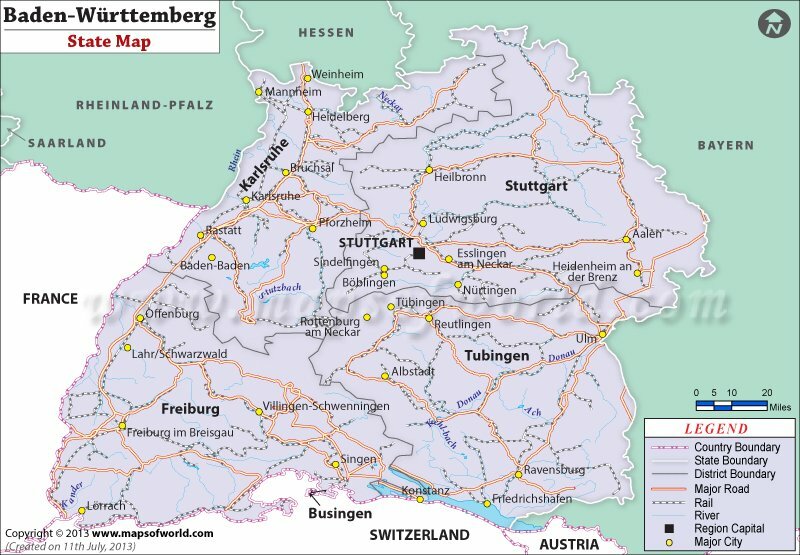 Baden-Württemberg is a prominent German state and is located in the southwest, east of the Upper Rhine. Covering an area of 14,060 square miles, the state accounts for 10.7 million inhabitants making it the third largest state in the country both in terms of size and population. The state comprises thirty-five districts and nine independent cities with its capital at Stuttgart, which is also its largest city. Also known as "small land" or "dear land", Baden-Württemberg has a rich history which dates back to the Roman era. Over the centuries it saw numerous developments and in 1952, officially became a German state. The other German states of Rhineland Palatinate, Hessen, and Bavaria and the nations of France and Switzerland share their borders with Baden-Württemberg. A well-maintained international airport is located at Stuttgart. The airport is served by almost all major carriers and operates flights to prominent German cities as well as around the world. You can also catch a train as the Deutsche Bahn rail system connects all the major cities of the state as well as the country. Stuttgart Christmas Market: This is a month long festival and people can be seen buying products such as wood toys, figurines, and antiques and gorging on the sumptuous mulled wine and fresh gingerbread. Mercedez Benz Museum: A must-see for motor enthusiasts, it gives tourists a perfect insight into the history of the company and the brands associated with it. Europa Park: It is the largest theme park in the country and is frequented by thousands of tourists. Other not to be missed places include the Porsche Museum, Freiburg Cathedral, Auto & Technik Museum, Fishermen's Quarter, to name a few.